Within the last few years, service providers have engaged in a wide array of initiatives to transform their networks and business models to monetize growing user demand for new interactive multimedia communications and entertainment experiences. While the drive to grow revenue is, and will remain, a core factor for operators, the requirement to save on operating and capital costs has more recently risen to equal prominence, as new data revenues have not yet made up for declining voice services and slowing subscriber growth for most operators. Many paths to more cost effective service provider operations are being examined. The most prominent of these is to migrate to an all-IP-based network. Whether fixed or mobile operator, this migration requires a transformation from time-tested legacy infrastructure with built-in reliability to a relatively new set of platforms that require careful engineering and integration to ensure a premium quality of experience. The transformation also requires changes in OSS/BSS and opens up the possibility of new service delivery and customer management business tools and models. As a result, service providers are engaged in a more complex integration environment than ever before. While the overall concept of transforming to an IP-based network is conceptually feasible, the multitude of migration and optimization requirements that are visible in todays network environment threaten to overwhelm service provider staff capabilities at a time when cost management is becoming the key priority. Project examples include British Telecoms investment in a converged IP core network, an intelligent service enabling infrastructure based on IMS, an operations support systems (OSS) architecture based on commercial off-the-shelf systems, and the development of an open application layer that allows faster time-to-market for traditional and Web 2.0 services. These initiatives, dubbed the 21st Century Network by BT, are based on a business case that emphasizes platform consolidation as a way to first reduce operating, development and maintenance costs; and eventually generate new services and new sources of revenue. The clock is ticking on achieving this transformation, as BT intends to close down its last PSTN switch in 2011. However, such cost reducing initiatives can be hampered by complexity; multiple projects are required to not only transform the various domains of the network, but integrate them into a seamless end-to-end working solution. The process of translating the vision of a transformed network into a positive business case and process road map can be very time consuming. After the road map is complete, then the work really begins with a multitude of sub-projects to drive the transformation of each network domain and the overall end-to-end network solution. In many cases, service providers lack the expertise to effectively carry out both the pre-transformation planning and the post-execution training and ongoing support of numerous projects. Manpower shortages and a lack of specific knowledge/expertise may be an issue for a small-to-medium operator, while even a large operator may lack the technology expertise in IP or Web services to effectively carry out the plan with only in-house resources. Alternatively, service providers may have internal expertise but wish to prioritize the utilization of these resources to address their core competence  developing and delivering end user services. Software and Internet services specialists focused on applications. Without careful management the cost and time requirements of the sub-projects may quickly wipe out a large portion of the cost savings in the original business case. However, one strategy being adopted by a growing number of service providers to minimize the cost of transformation is to select a single integrator that brings together a combination of its own skills and a roster of best-of-breed partners to achieve desired transformation goals in the most efficient manner. 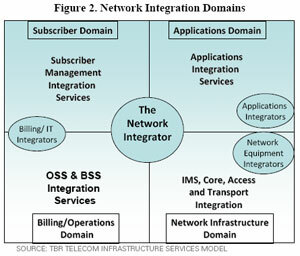 According to TBRs Telecom Infrastructure Services Model (TIS), service providers worldwide will spend more than $15 billion on integration services in 2008, as shown in Figure 1 below. 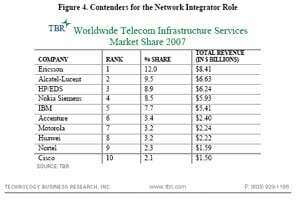 TBRs TIS Model tracks telecommunications infrastructure services spending by service providers worldwide. Published semiannually, the model is based on analysis and forecasts of product-attached or capex-driven services such as deployment and maintenance, and non-product-attached or external opex-driven services such as professional and managed services. Transformation in the Subscriber Domain enables a shift from mass market services built to provide a common experience to all end users, to easily accessible services tailored to the individual on demand. Service providers are well-positioned to deliver these services because they can leverage assets such as subscriber presence and location information, subscriber preference information, single sign-on capability, real-time rating and charging, and content administration. Service providers gain differentiation by an ability to account for individual preferences and desires, which builds customer loyalty and reduces churn. In addition, this new capability allows service providers to field alternative business models such as advertising. In addition, the transformed Subscriber Domain makes it easier for service providers to deliver third-party applications that support value-added services tailored to the individual subscriber. Critical to this capability is the ability to provide third-party services access to federated subscriber data. To transform the Subscriber Domain, operators must integrate multiple subscriber systems into an optimized management system that allows subscriber data to be quickly and easily accessed by service provisioning and delivery and billing systems. However, the transformation process goes beyond simply replacing aging silos of subscriber data with a distributed intelligent database: transforming the subscriber domain means enabling personalization and delivery of targeted content for end users, in addition to consolidating platforms, while maintaining the quality of experience, regardless of the targeted end user network or device. The Application Domain of the network is perhaps the most critical of the four domains. As service providers rapidly convert to software-oriented architectures that support concepts such as write once, deploy everywhere applications, the ability to provide a common development platform is crucial. For example service providers such asAT&T base their implementation of new service layer-enabling technology on the number of services they can rapidly bring to market. With AT&T in the midst of deploying U-verseIPTV service for the home and high-speed HSPA wireless broadband networks, the goal for a growing number of these services is that they be accessible via three screens  the PC, the television and the mobile device. In addition to the three screens target, service providers are leveraging SOA and Web 2.0 environments to reduce the time to market for application deployment. The goal is to make available IP-compatible services as quickly as possible. This requirement increases the need for a well-integrated application delivery environment that can seamlessly leverage the underlying IP network. Added to these requirements is the ability to present and quickly deploy applications from third-party developers without reengineering network interfaces. The new Applications Domain must not only be capable of delivering to any access point, but must also be capable of seamlessly integrating with non-native applications. The transformed service delivery environment therefore requires seamless migration and mediation services for third-party applications. Integrating billing and operations support systems (OSS) are crucial to managing customer revenue acquisition and retention, and ensuring network and applications reliability and consistent quality of service. Transformations in this area typically focus on consolidating diverse OSS and BSS systems that today address separate silos or applications, to create a single, consolidated support management system that tracks and manages the customer based on all his or her relationships with the service provider. In concert with the subscriber and application domain evolutions, future billing systems must evolve to support new customer relationships and new application revenue recognition models such as advertising and third-party revenue sharing. OSS consolidation on commercial off-the-shelf platforms is gradually replacing the highly customized platforms of the past. These operational support systems must also accommodate new network elements, particularly the ability to monitor and manage IP traffic and cross-domain applications. The integration of high capacity access networks with common core network elements supporting reliable delivery of IP multimedia services requires unique expertise. Service providers are increasingly relying on partnerships with equipment suppliers to guarantee quality of service in these implementations. Many are turning to out-tasking or outsourcing models to reduce costs for in-house training. Ultimately, however, integrating the layers of network infrastructure from the device to access, aggregation, edge, core and transport to deliver services in an optimized seamless manner requires a range of network integration skills. Further, these evolutions must be accomplished in concert with transformation in the other domains to achieve effective end-to-end implementation. As Figure 2 indicates, the Network Integrator delivers best-in-class integration capabilities within each of these four domains and, most importantly, delivers the design, project management and integration services expertise to integrate the entire set of domains to deliver the desired services to end customers. Without sufficient attention to integration requirements across domains, service providers run the risk of lack of project coordination, imbalanced investments among the various domains and not meeting end-to-end service objectives. A Network Integrator is often needed to resolve such issues because many service providers still operate in silos of control, in which each domain is owned and managed by different stakeholders in the company. Verizon Wireless, a mobile business joint venture with Vodafone Communications, which is upgrading capacity to support VoIP and fixed mobile convergence by means of dualWiFi /CDMA devices. There are a number cost savings benefits to working with a Network Integrator, including 1) consolidating supplier management, 2) maintaining overall project vision and 3) ensuring project goals are achieved in a timely fashion. By establishing the transformation process as a project under the guidance of a single Network Integrator, the service provider consolidates the cost of supplier management. Rather than manage a host of subprojects with different suppliers, the service provider, according to the business plans, maps out a vision and sets performance expectations according the business plan with a single partner. The Network Integrator is responsible for managing the subprojects within the context of multivendor agreements with the appropriate third parties and the service provider. With the right Network Integrator, the service provider will also be able to turn over supplier sourcing, resulting in additional savings in time and staff resources. Alternatively, the Network Integrator may be required to work with other suppliers identified by the service provider. The integrator must be skilled at both identifying appropriate suppliers and working with installed base suppliers or service provider preferences. Because of the multiple domains involved, service providers can easily become focused on a portion of the transformation within a single domain rather than maintain the complete roadmap. Operating independently, suppliers can move at varying speeds within subprojects and lose track of the big picture. These issues can cloud the once-clear evolution/transformation path across domains, causing imbalanced investments and outcomes for key milestones. For example, an IT supplier may implement an integration project involving the deployment of new consolidated BSS/OSS platforms without sufficient understanding of the changes in the underlying network, or parallel subscriber and applications domain. This may require costly additional integration expenses to create the appropriate interfaces or even change major aspects of platform functionality to accommodate the misunderstandings. Acting as the chief project manager, the Network Integrator ensures that cost savings through platform consolidation and other transformations are achieved according to deadline. Often these savings can be delayed due to interdependencies of the various sub-projects. The Network Integrators role is to help the service provider identify interdependencies and effectively manage them to meet the project timeline. The Network Integrator may bring its own design and analysis tools to bear on the full-scale transformation, allowing better risk mitigation and contingency planning across all subprojects and suppliers involved. As in the case of BT, while many of todays transformation projects are based on business cases that focus on cost reduction, operators understandably expect to attain new sources of revenue at the end of any transformation project. Decreasing time-to-market and reducing investments required to launch new products and services will continue to be requirements in transformation projects. While many service providers engage in IP transformation as a hedge against future challenges to their business models, most foresee the impact of new sources of revenue from services that blend personalized content with multimedia and multi-device access capabilities. They also expect new revenue sharing and advertising models to create incremental revenue. These future value/benefit expectations are driving todays transformation projects. The Network Integrator must possess sufficient expertise with new revenue sources to achieve the revenue-generation milestone, and not just settle for delivering cost savings. This commitment is a change from the traditional position of equipment suppliers, who have historically operated with a philosophy of if we build it (the network), they (subscribers and revenue) will come. In short, the delivery of the subscribers through investments in customer acquisition was up to the service provider. The age of the Network Integrator does not mean a fundamental shift in roles. Service providers must still invest in customer acquisition and focus on new services development. But the Network Integrator, operating in partnership with the service provider to achieve the transformation vision, shares the requirement to secure subscribers. To this end, the Integrator must possess end-customer knowledge through research and experience so that the transformations within each domain cater to real revenue value for the service provider. 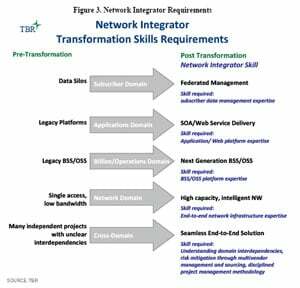 Figure 3 maps the Network Integrator skill requirements to the key domains to achieve the transformation sought by the majority of service providers today. The data indicates that the Network Integrator role requires both domain and project management expertise at a multivendor level, as well as experience achieving transformation milestones. The Network Integrator, in this case Alcatel-Lucent, provided complete end-to-end cross-domain project management. Regardless of the equipment we used in the network, the integrator was responsible for it all, even including the testing and quality assurance tools, Lawrey said. The key for Telstra was to work in close collaboration with the Network Integrator, which provided a single point of accountability. In addition to managing the interdependencies of a multivendor, cross domain environment, the Network Integrator provided the critical functions of ensuring that subscribers would be served efficiently with the quality of experience Telstra expected. Lawrey characterized this as making sure the customer delivery system operated effectively, including services activation and network assurance. Telstra achieved cost savings of 30% to 40% by employing a single Network Integrator, Lawrey said, including via a reduced workload on Telstras staff and through cost savings in equipment and services from the suppliers involved in the project. By pushing the workload to a single integrator we achieved economy of scale, Lawrey said. The transformation of Telstras network domains is an ongoing project that includes the complete lifecycle of deployment, operation and maintenance. Lawrey expects the Network Integrator to come along for the entire journey. We have built a relationship not only with the country team, but also the global assets of the supplier. We have a deeper relationship with coordination of global road maps and strategy. This is a partnership for the lifecycle of the network, Lawrey said. While not all firms can fit the bill across the range of skills required for the Network Integrator role among suppliers, service providers have a short list of consolidated firms that are vying for the opportunity. 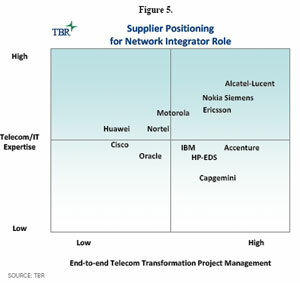 These include the largest suppliers of telecom infrastructure services as shown in Figure 4. The importance of the Network Integrator role will continue to grow as service providers move more aggressively toward transformation. Maintaining the skill sets and delivering on the project milestones will be key differentiators for suppliers in both IT and telecom going forward. Alcatel-Lucent has an early lead with positions in a number of major service provider projects. With the role of Network Integrator open to a single supplier at each account, the companys position is the strongest of the top suppliers. However the position will not go unchallenged; each supplier will work from its installed base and technology position to gain the role. A new standard aims to offer gigabit-speed connectivity without the clutter of cables. The Wireless Gigabit Alliance, a consortium of electronics companies, has established a specification for 60 gigahertz wireless technology that can offer users data transfer speeds ranging from 1 Gigabits per second to 6 Gbps. To put it simply, WiGig could be at least ten times faster than todays Wi-Fi and it could be available to consumers by the end of next year. The need for fast wireless data transfer plays into two big trends: the proliferation of multimedia and the increasing cable clutter than users have to deal with. Users are increasingly getting hooked on Hulu, browsing through Flickr and clicking on YouTube shorts. But for all their new streaming media players or cameras, consumers havent been able to cut the cord. Thats where WiGig could step in. The standard will allow for extremely fast file transfers, wireless displays, streaming media, and wireless connections for devices such as cameras, laptops and set-top boxes among other things, says the Alliance. It wont have the same range as a Wi-Fi network but it is ideal for devices that want to communicate without wires at gigabit speeds within a room or adjacent rooms, says Grodzinksy. WiGig joins a fray of wireless standards that are fighting to free consumers from being tethered to their devices. In most homes, Wi-Fi has emerged as the standard technology for wireless access. But it is too slow to handle high-definition video or transfer pictures from the camera to the laptop. 802.11g Wi-Fi: The basic and most widely used Wi-Fi connectivity offers speeds of up to 54 Mbps. 802.11n Wi-Fi: The faster W-Fi standard it offers data transfer at up to 300 Mbps. Standard Bluetooth: Most widely used between cellphones and headsets, it offers top transfer rate of about 3 Mbps. Bluetooth 3.0: The high-speed successor to standard Bluetooth, its top transfer rate hover around 24 Mbps. Wireless USB: It can offer speeds of up to 110 Mbps at a range of 10 meters and 480 Mbps over a range of 3 meters. Wireless HD: Aimed at HD video transfer it can offer speeds of up to 4 Gbps (for 10 meters). Theoretical speed can go up to 25 Gbps. WiGig: The newest kid on the block tantalizes with promise of speeds ranging from 1 Gbps to 6 Gbps. Zigbee: This low-power wireless standard is for applications that require low data transfer but quicker response time such as remote controls. Meanwhile, other standards such as wireless HD and Zigbee have sprung up offering to solve these problems. But they just arent broad enough to be used across multiple applications. Take wireless HD. Despite its promises of high speed connectivity, it is largely seen as a vehicle for high-def video transfer. WiGig also benefit from the use of the unlicensed 60 GHz spectrum, says Mathias. The availability of greater bandwidth in that spectrum allows for faster transmission. For now, the specification isnt final. The Wireless Gigabit Alliance hopes to complete it by the end of the year. From there it is up to companies to bring the technology to market. WiGig will also have to battle other technologies to become the de facto standard. WiGig is likely to bump up against IEEEs attempts to introduce follow-ups to the 802.11g and 802.11n Wi-Fi standards. The IEEE (Institute of Electrical and Electronic Engineers), a non-profit organization, has been working on proposals to introduce the extremely high throughput 802.11ac and 802.11ad standards. The 802.11ad standard will also be based on the 60GHz spectrum but is not expected to be available before 2012. Either way this battle of the standards plays out, it is clear for consumers truly high-speed wireless data transfer is zipping into their living room. Competitive pressures, globalization, rising energy prices, and increasingly stringent regulations are driving companies to cut costs while increasing efficiency and productivity. Industry leaders feel pressure to adopt new technologies that will help them gain competitive advantages wherever they can find them. One of these promising new technologies is wireless sensor networking. Wireless sensor networks (WSNs) dramatically reduce the cost of installing and commissioning instrumentation in industrial facilities. More instrumentation means better visibility into operational and environmental variables that affect overall uptime, safety, and compliance. WSNs connect critical processes and assets with the systems or experts that can interpret the data or take immediate action. At the end of the day, operational teams with more visibility into their processes can prevent unplanned shutdowns, increase efficiency, and keep workers safe. WSN is a term used to describe an emerging class of embedded communication products that provide redundant, fault-tolerant wireless connections between sensors, actuators and controllers or systems. WSNs provide access to assets or instruments that were previously deemed unreachable due to physical or economic barriers. The WSN label typically describes products that provide performance above and beyond traditional point-to-point solutions, particularly in areas of fault tolerance, power consumption and installation cost. Wireless Challenges While wireless provides clear cost and flexibility advantages, it also presents some challenges. Point-to-point radio communication links are notoriously variable and unpredictable. A link that is strong today may be weak tomorrow due to environmental conditions, new obstacles, unanticipated interferers and myriad other factors. These factors can be boiled down into three major failure modes: interference, changes in the physical environment that block communication links, and loss of individual nodes. RF interference: The small portion of the electromagnetic spectrum devoted to general-purpose wireless communication devices is crowded with traffic from Wi-Fi networks, cordless telephones, bar-code scanners, and innumerable other devices that can interfere with communications. Because there is no way to predict what interferers will be present in a facility at a given location, frequency, and time, a reliable network must be able to continually sidestep these interferers on an ongoing basis. Blocked Paths: When a network is first deployed, wireless paths are established between devices based on the immediate RF environment and available neighbors. Unlike wired networks, these variables often change; paths may later be blocked by new equipment, repositioned partitions, delivery trucks, or very small changes in device position. Assuring reliability for the life of the network, not just the first few weeks after installation, requires continually working around these blockages in a transparent, automatic fashion. Node Loss: Node loss is an important issue to consider with wireless sensor networks. While node failure because of semiconductor or hardware malfunction is rare, nodes may be damaged, destroyed or removed during the life of the network. Additionally, power surges, blackouts, or brownouts can cause nodes to fail unless they have an independent power source. End-to-end reliability requires the networking intelligence that routes around the loss of any single node. Any of these problems will bring down a point-to-point wireless link. However, with a network architecture designed to protect against these issues, the network can isolate individual points of failure and eliminate or mitigate their impact, allowing the network as a whole to maintain very high end-to end reliability in spite of local failures. Similarly, a well-designed wireless network architecture will transparently adapt to changing environments, allowing long-term operation with zero-touch maintenance. WSNs aim to overcome these challenges by applying self-organizing and self-healing intelligence to continuously adapt to unpredictable conditions. The goal of WSN technology is to provide extremely high reliability and predictability for years at a time without constant tuning by wireless experts. Time Synchronized Mesh Protocol (TSMP) provides a mechanism for WSN intelligence. By defining how a wireless node utilizes radio spectra, joins a network, establishes redundancy and communicates with neighbors, TSMP forms a solid foundation for WSN applications. TSMP Overview TSMP is a media access and networking protocol that is designed specifically for low power, low-bandwidth reliable networking. Current TSMP implementations operate in the 2.4 GHz ISM band on IEEE 802.15.4 radios and in the 900 MHz ISM band on proprietary radios. TSMP is a packet-based protocol where each transmission contains a single packet, and acknowledgements (ACKs) are generated when a packet has been received unaltered and complete. Mechanisms are in place to transport packets across a multi-hop network as efficiently and reliably as possible. All measures of reliability and efficiency are done on a per-packet basis. Packet Structure TSMP packets consist of a header, a payload and a trailer. Packets contain fields that identify the sending node, define the destination, ensure secure message transfer and provide reliability and quality of service information. For the purposes of this article we will discuss the implementation of TSMP on IEEE 802.15.4 radios. The IEEE 802.15.4 standard specifies a maximum packet size of 127 B, TSMP reserves 47 B for operation, which leaves 80 B for payload. Time Synchronized Communication All node-to-node communication in a TSMP network is transacted in a specific time window. Commonly referred to as Time Division Multiple Access (TDMA), synchronized communication is a proven technique that provides reliable and efficient transport of wireless data. Unlike wired systems where nodes can be directly connected by a dedicated wire (media), to the exclusion of neighbors, in a wireless system all devices within range of each other must share the same media. Several other Media Access Control (MAC) mechanisms are available including CSMA, CDMA and TDMA. TSMP is based on TDMA. Timeslots and Frames In TSMP, each communication window is called a timeslot. A series of timeslots makes up a frame, which repeats for the life of network. Frame length is counted in slots and is a configurable parameter. In this way a particular refresh rate is established for the network. A shorter frame length increases refresh rate, increasing effective bandwidth and increasing power consumption. Conversely, a longer frame length decreases refresh rate, thereby decreasing bandwidth and decreasing power consumption. A TSMP node can participate in multiple frames at once allowing it to effectively have multiple refresh rates for different tasks. The concept of slots and frames is illustrated in Figure 1. Figure 1. TSMP Timeslots and Frames.Synchronization A critical component of any TDMA system is time synchronization. All nodes must share a common sense of time so that they know precisely when to talk, listen, or sleep. This is especially critical in power-constrained applications like WSNs where battery power is often the only option, and changing batteries can be costly and cumbersome.In contrast to beaconing strategies employed by other WSN implementations, TSMP does not begin each frame with a synchronization beacon. Beaconing strategies can require long listen windows which consume power.Instead, TSMP nodes maintain a precise sense of time, and exchange offset information with neighbors to ensure alignment. These offset values ride along in standard ACK messages and cost no extra power or overhead.A common sense of time enables many network virtues: bandwidth can be pre-allocated to ensure extremely reliable transmission and zero self-interference; transmitting nodes can effectively change frequencies on each transmission and the receiving node can keep in lock-step; bandwidth can be added and removed at will in a very predictable and methodical way to accommodate traffic spikes; and many others. Duty Cycling It is important to note that TSMP nodes are only active in three states: 1) sending a message to a neighbor, 2) listening for a neighbor to talk, and 3) interfacing with an embedded sensor or processor. For all other times the node is asleep and consuming very low power. In a wireless device the majority (generally >95%) of the total power budget is consumed by the radio, not the processor. To achieve low power, it is clear that one must minimize radio on time. TDMA is very good at this. Timeslots are measured in milliseconds and in typical WSN applications this leads to a duty cycle of less than 1% for all nodes in the network (including those relaying messages for neighbors). Because all nodes (including those often called .routers.) can be aggressively duty cycled, TDMA is the only practical solution for a fully battery-powered network. In addition to slicing the wireless media across time, TSMP also slices it across frequency. This provides robust fault tolerance in the face of common RF interferers as well as providing a tremendous increase in effective bandwidth. Commonly referred to as Frequency Hopping Spread Spectrum (FHSS), hopping across multiple frequencies is a proven way to sidestep interference and overcome RF challenges with agility rather than brute force. Another technique to overcome RF challenges is Direct Sequence Spread Spectrum (DSSS). DSSS provides a few dB of coding gain and some improvement in multi-path fading. While beneficial, DSSS is not sufficient in the face of common interferers in the band, including Wi-Fi equipment, two-way radios or even Bluetooth (see figure 2 below). Figure 2. Frequency Hopping vs. DSSS in 802.15.4 Networks. It should be noted that a combination of FHSS and DSSS provides both interference rejection (FHSS) and the coding gain (DSSS).The other technique for overcoming interference is increasing the radio power, effectively turning up the volume. Although often effective, turning up the volume on IEEE 802.15.4 radios kills battery life and is not an ideal solution for low-power WSNs.Hopping Sequence Upon joining a network, a TSMP node (call it node C) will discover available neighbors and establish communication with at least two nodes already in the network, call them parent A and parent B (more on this in later sections).During this process node C will receive synchronization information and a frequency hopping sequence from both parent A and parent B. The IEEE 802.15.4 standard specifies 16 distinct frequency channels within the 2.4000-2.4835 MHz ISM band . so let’s use 16 as our number. The hopping sequence is a pseudo-random sequence of all available channels. For example the sequence may be: 4,15,9,7,13,2,16,8,1,etc. Node C receives a distinct start point in the sequence from each parent, and when a new node joins it, it will in turn give a distinct start point to this new child node. In this way each pair-wise connection is ensured to be on a different channel during each timeslot enabling broad use of the available band in any one location. In operation, each node-to-node transmission (say C to A) is on a different frequency than the previous transmission. And should a transmission be blocked, the next transmission will be to an alternate parent (C to B) on a different frequency. The result is simple but extremely resilient in the face of typical RF interferers. Wi-Fi networking is becoming more popular for embedded applications for much the same reasons as Ethernet networking became popular. The technology is familiar; the equipment to set up the network is inexpensive; and it enables easy communication with PCs and other devices on existing network infrastructure. However, implementing Wi-Fi networking for embedded systems poses some special challenges for the embedded systems designer. Which features should you look for? Which are most important? What special considerations should you be aware of? This article aims to help you understand the peculiarities of Wi-Fi for embedded systems so that you can choose the best Wi-Fi implementation based on your needs. 	Does the solution provide full Wi-Fi access (including access to socket-level programming) or simply serial-to-Wi-Fi? 	Will the Wi-Fi solution be available long-term? What issues can you expect over the long-term? 	Is 802.11g or 802.11n supported, or only 802.11b? 	Which security (encryption and authentication) features are supported? 	Is the solution FCC-certified? Can you integrate the solution into your product without additional certification? 	What about certification with other regional authorities? Is multidomain (802.11d) supported? 	What is the maximum data throughput for the solution? How does Wi-Fi encryption and authentication affect your throughput? 	What is the power usage of your Wi-Fi solution? Are low-power modes supported? 	Does it provide typical Wi-Fi range, or is performance compromised? 	What is the operating temperature specification? 	How is antenna placement handled, and can you use an antenna other than that which is provided? 	Is roaming from one access point to another handled cleanly? Each of these questions will be explored in turn. By studying these questions and researching the answers based on your requirements and the Wi-Fi solutions you’re exploring, you should be much closer to selecting the right solution for your product. Many Wi-Fi devices for embedded systems provide only serial-to-Wi-Fi functionality. The idea is that the Wi-Fi device has preloaded firmware, and you use a serial port on your embedded device to interface with the Wi-Fi device. This is very similar to serial-to-Ethernet devices. Serial-to-Wi-Fi devices make it easy to add some limited Wi-Fi capability to existing embedded devices (as long as a serial port is available). 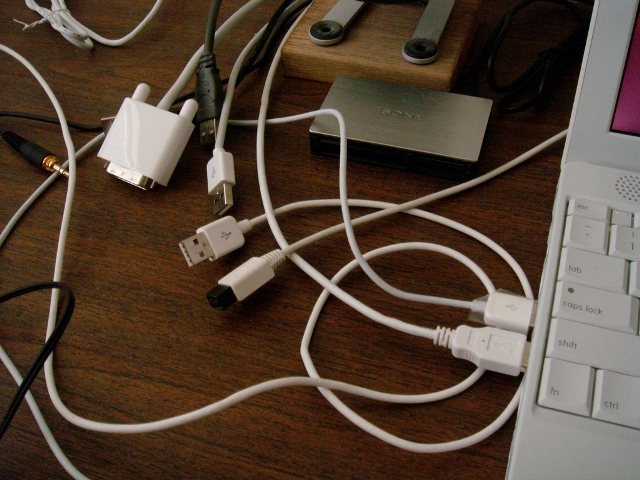 This option works well for applications that need only one connection (or socket) at a time. It is especially well-suited for allowing a serial port to be accessed over the network. If you need the ability to run multiple servers or clients on your device (such as a web server, FTP server, and email client), serial-to-Wi-Fi devices probably will not provide enough flexibility. An increasing number of single-board computers and core modules are available that have Wi-Fi integrated as a native network interface. The native network interface typically allows full socket-level access so that you can run concurrent servers and clients–in other words, a full networking system. This can make for an overall cheaper solution since a separate device is not needed. Of course, if you are adding Wi-Fi capabilities to an existing system, the serial-to-Wi-Fi devices will be much easier to implement as long as the limitations are acceptable. The push for more consumer involvement in smart grid initiatives is slowly becoming more evident as companies and utilities attempt to grasp the overall impact of government mandated deployments of the smart meter. Understanding what the consumer needs and wants is quickly rising in importance with the goals and objectives of the energy industry. There are various views and opinions as to how the US federal and state mandate translates to practical solutions. Primary as a viable solution is the deployment of smart meter technology. But not all smart meters are the same, hence the need for a more encompassing option. The complicated field of metering with its canopy of applicable hardware and software results in making intelligent decisions a difficult and rocky road for AMI proponents. Some have focused instead on defining what a smart meter is or isnt. The resulting business models may or may not be implementable as technology changes the landscape or costly if human behavior fails to adjust to and embrace the deployed solution. One thing is certain, that a smart meter without interaction from the occupants would diminish the gain in energy use reduction and jeopardize the utilities attempts at conservation and global warming compliance. If the solution isnt found through meter deployments, then it stands to reason that involving the consumer via technology and education makes sound business and good social sense. This brings us to the need for a home automation network (HAN)  either a simple system or a complex one. Many envision the HAN with the smart meter as the center or focal point for data gathering and exchanging. The smart meter is the gateway through which the rest of the world garners information about the occupants electricity consumption. Others would rather have an independent gateway within the premise that is more controlled by the occupants with privileges allocated to the utilities or an AMI service company. The meter then would be just another peripheral device in the network that links the local network with the outside utilities. The internal home gateway would restrict and determine what information is available to external sources. The former is more in line with what the utilities are implementing while the latter favors the telecom, cable, and IT industry approach, which focuses on broadband home networks and less on low power mesh. Planning a HAN in an uncertain market that is constantly changing and evolving can be daunting to any individual or company considering AMI deployments. Most seek simple solutions that require very little capital or are constrained to limited HAN implementation. Deploying programmable communicating thermostats (PCTs) is one way of semi-automating the home environment for demand response. Using in-home displays that link the external meter to a remote handheld or tabletop unit is another. Whatever the technology used, these early approaches to consumer involvement demonstrate a growing awareness for HAN planning and consideration. Critical to planning any future HAN system is the communications architecture being considered. The current emphasis on mesh radio technology and the availability of completely different mesh protocols (ZigBee, Z-Wave, OpenRF, and so on) within each of these radio systems creates both opportunity and potential disaster when considering HAN development and deployment. Other networked communications architectures include power line modems, Ethernet, Wi-Fi, Bluetooth, and RS485  all which add layers of complexity to deploying HAN technology. Coupled to this melee of competing options is the dearth of home networked products that provide meaningful and practical demand response solutions. Making the right choice of communications backbone may well be defined in the legacy system requirements, the data requirements, the environment in which the HAN is located and how the HAN is to be used by the occupants. Cost and ease of deployment/implementation along with the level of after sales support required are considerations that impact a successful planned launch. Whatever choice is made, the decision to go with one or the other could also limit the availability of peripheral devices that can operate within that chosen communications architecture and by default the functions and features available to the consumer. So choosing wisely is paramount. The correct solution to determining a HAN configuration is the backwards approach. Simply put, deciding what end result the network must accomplish and then determining which technology is best suited to do this. In most instances, a cost analysis report or a business case based on reliable information would suffice in evaluating the technology being considered. In other situations where the technology is not proven or the decision makers are not knowledgeable, a trial or test site may be necessary to familiarize everyone with the option. As mentioned earlier, the market forces driving HAN development and deployment are directly related to the industry and its perspective of market need. Other drivers such as political and global issues also impact consumer anxiety and perception within the market. Hence developing a strategy for HAN architecture must take into consideration those drivers. Node controller/gateway/central controller. A node controller is common within mesh networks for maintaining the communications link and exchanges necessary within the protocol. It may or may not be the gateway. The gateway, on the other hand, is the portal through which multiple conflicting protocols link and talk seamlessly. A central controller can be all three plus a data manger/data logger. 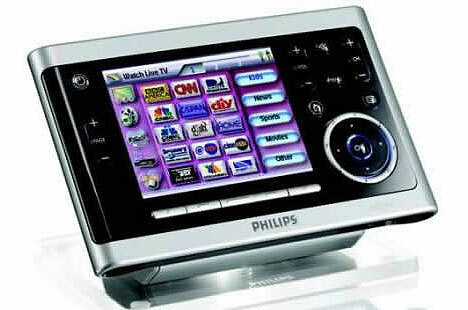 It manages the network from a user perspective (such as a home computer or a home media server which can act as the controller). Peripheral devices. The fingers and hands of the HAN are seen in the sensor devices that gather information or provide levels of control. Such devices, such as a PCT, provide a measure of remote command and control to the premise HVAC system. Internal to these devices is the communications backbone which links the devices to the central element of the network. Software. There are myriad functions that must be accomplished for a HAN to successfully fulfill its intended design. For example, the mesh protocol software manages the mesh network communications within a low power radio configuration. At the gateway, the different protocols must be translated correctly and the data sent to the correct recipient. Throughout the network, some form of security must be employed  whether through software encryption or access denial methodologies. There is a large amount of embedded code within the peripherals that program the tasks associated with those devices. These command and control codes must be incorporated into a central controller which provides remote interaction with the sensing devices. External to the HAN is the smart meter which may be the gateway to the utility. The smart meter may also just be a peripheral if the HAN has its own dedicated gateway. A smart meter that is very basic or uses wired access may need a HAN that incorporates a gateway. Shifting the gateway away from the meter may be a better cost solution or a strategic decision based on any number of factors. When deciding on the HAN to meter interfacing, these type decisions need to be considered.